Every summer holiday my little daughter and myself are visiting the Spa Town of Luhacovice for few days. We are very fortunate we are living only half and hours drive away. It’s an amazing little spa town with 15 thousands litrs of mineral water reaching the surface there every day, containing a large amount of dissolved mineral elements, with several natural springs. These are successfully easing people’s problems with bronchitis and asthma. The kids programs especially are very successful here. The architecture of the town is very interesting and unique as well, as you will see from the pictures below. Anyhow the two of us just coming here to have a fun – mainly swimming, taking long walks, trying to taste every spring and playing. 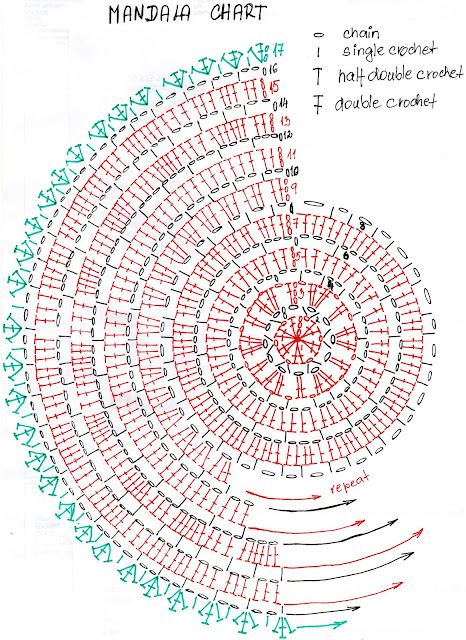 Just to stay in good mood I made for you a pattern for mandala wheel. The size of the coaster or mandala really depends on you. 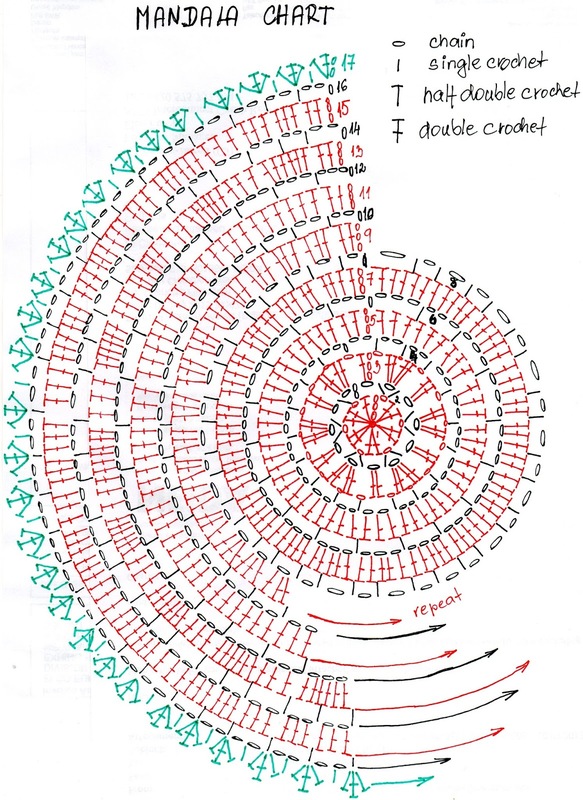 Work the mandala or coaster in rounds. Do not turn. Slip stitch on end of each round; use chain stitches on the start of each new round (count as sc or dc). Start with magic ring or ch5 – slipstitch into first chain to form a ring. Pattern notes: If you would like to make the tablecloth bigger or smaller - the basic motive is repeating every 21 stitches. The size may vary slightly depending on type and/or thickness of thread you using. Ch 114, dc into 5th ch from the hook and continue according to the chart. Repeat rows 2-11 as many times as needed. (On the picture there are 101 rows). In last row (101) make ch4 instead ch13. Row 1: Ch3 (counts as dc), dc in every stitch, 4dc’s in every ch space. (116dc’s) Turn. Row 2: Ch3 (counts as dc), *ch8 – skip 4dc’s - dc into 5th dc*, repeat from*to*. Turn. You should have 23 loops. If you came up with any problems or difficulties, write to me, I’ll be more than happy to help. In the last three weeks I have been trying to make this white top. I love the pineapple design a lot on everything. After a bit of googling I found few free charts and I started to crochet. I have to admit I was not very successful. None of the tops I was trying to make based on the charts I had came out the way I wanted. They were hanging too much or/and didn’t have any form or shape. After trying all sort of materials and playing with the charts (mainly adding and reducing chain stitches) I came up with this version. It’s based on a free chart I found. I had to enlarge it and modify it. I tried to make it as visible as possible, but feel free to write me on: emmhouse@seznam.cz, if you still have difficulties. I’ll send you the original chart scan or/and pics, so you can enlarge it even more. I used cca 200g (772m) of yarn suitable for E/3,5 mm hook (It’s better if you are using yarn with some elastic in it – it’ll give the top nicer form, than 100%cotton). Note: dtrc - Yarn over 3 times, insert hook into stitch, yarn over, pull through a loop, [yarn over, pull through 2 loops] 4 times. It is worked in circular crochet method, beginning at the top going down. Ch3 at the beginning counts as dc. Slip stitch to join at end of each round and slst. over 2dc’c into ch3 space. Don’t turn, but continue in same direction. (This is applying to rounds 1- 20 of the top part, sleeves, and to rounds 1 – 32 of the body/bottom part of the white top). Ch 160 (It’s better to crochet with two strings and D/3mm hook), slst. to first ch. Make sure it doesn’t twist. From here on you continue with one string of the yarn and E/3,5mm hook. Round 1: ch3 (counts as dc), dc into next ch, ch3, dc into next 2 ch, ch5- skip 4ch and repeat to the end. You should have 20 2dc/ch3/2dc(shell) groups with ch5 between them. Round 4: slst into ch3 space, ch3 (counts as dc), dc into same space, ch3, 2dc into same space, ch8, 2dc’s – ch4 -2dc into same space into nest shell. 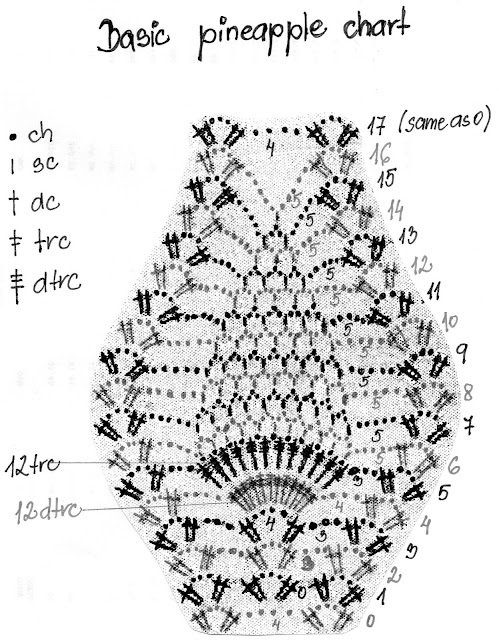 If you have trouble to see the amount of ch stitches you should make, there is: ”Basic pineapple chart” you can follow – it is much clearer. This chart doesn’t apply for first 6 rounds. By end of round 20 the piece should measure cca 20cm/8”. Fasten off. Lie the top down flat (pineapple on pineapple) as you can see on the photo, and mark down where the sleeves will be before you continue to crochet. Round 1: Start where indicated on photo. Ch3, dc - ch3 – 2dc’s in same shell from previous round, ch3, 2 dc’s into next (middle) shell, ch4 (do not continue with sleeve – skip the next shell, unfinished pineapple, 3 shells, another unfinished pineapple, next shell and all the ch’s between), 2 dc’s into next (middle) shell, right opposite the shell with 2dc’s before you did ch4. Continue following the chart until you get to second sleeve opening. Make it the same way as the first one. I have to say that I cannot explain it in words any other way. I’m sure, that if you look at the photo, you’ll be able to put it together. It looks complicated, but it really just sounds that way. It’s not. Round 2–32: Follow the chart. Fasten off. At this point you should have 6 unfinished pineapples. Sleeves: Start where indicated on photo. Follow the same directions as for the top’s body. You will end up at round 32 as well, with 2 unfinished pineapples. Start from the right side of the top. From now on you’ll be turning your work on the end of each round!!!! Follow ”Basic pineapple chart” from rounds 10 – 17. 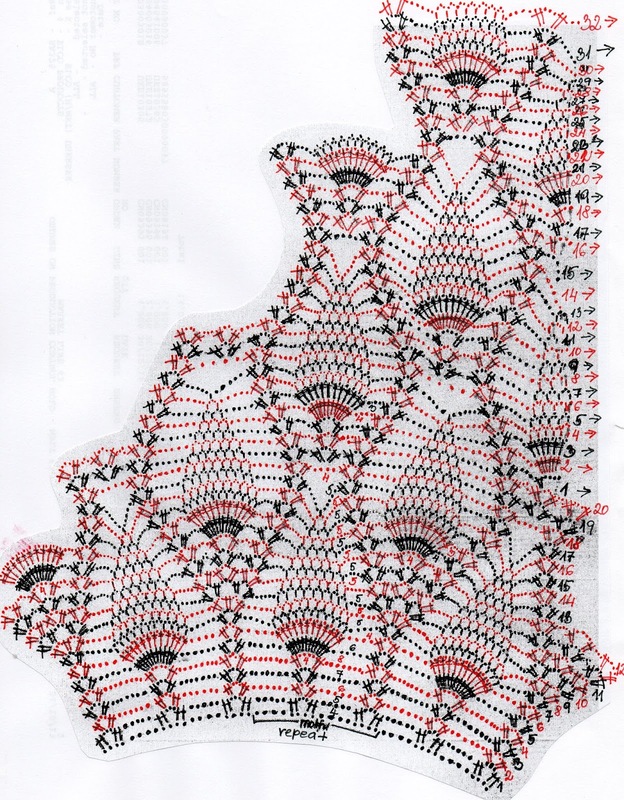 In round 17, you don’t have to crochet 4 chain stitches between shells. I haven’t done any ch stitches. You should see how the top is looking by now, to see how many ch is suitable for you. Finish all 10 pineapples (6 bottom + 4 sleeves). I haven’t made any edging. I believe it’s not needed, it’s pretty as it is.